Hicham Chajai was born in France with Moroccan origins. While studying engineering in Paris, he attended Calligraphic courses with the Syrian Master Frédéric Fattal. He taught him the rigorous techniques of Diwani and Koufi. 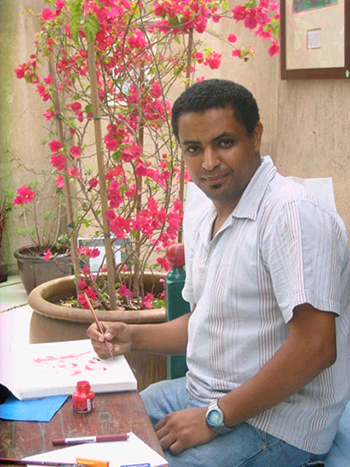 Hicham lived in various regions through his studies and work. His creativity and passion is enabling him to develop his own expression. Driven by his strong willingness to build bridges between people and across cultures, Hicham organized various exhibitions, workshops and seminars with companies, universities or institutions across Europe, Africa and Middle East. These opportunities are a continuous exchange of ideas and inspiration with local artists. These conversations helped Hicham to further develop its unique style and innovation. The journey through this website will give you a glance of his innovative mind. You can contact him if you want to explore new ideas through Calligraphy. Calligraphy is the Art of writing beautiful letters. This Art has been widely developed in the Arab Muslim world. Diwani, Thuluth, Koufi, Farsi are some of the famous styles created throughout the history and regions. The strict rules in the construction of the alphabet still allowed the expression of beauty, harmony and emotion. This perfect combination is such that Arabic Calligraphy has become an authentic Art. Calligraphy can be found in a rich variety of places such as holy books, official documents, architectural monuments and ornaments among others. In recent years, Modern Calligraphy has explored new frontiers and embraced new forms of expression. The creativity of Calligraphers enabled the perpetuation of this goal to combine with harmony technicity and beauty, mathematics and emotions. Historical styles are still alive and new styles are flourishing inspired by special techniques from painting, sculpture, 3D designs, street art and many others. Hicham Chajai is presenting in this website a flavor of his new vision for calligraphy. Have a nice journey !!! Arabic calligraphy is a millenary art that harmoniously links tradition and modernity. Its history is extraordinary. As it spread from Andalusia to China, passing through Maghreb, the Middle East, Turkey and Iran along the way, calligraphers continually enriched the art with new styles, new techniques and new influences. This course focuses on Diwani style, using an innovative pedagogical approach adapted to all levels that will make learning easier through the combination of short moves and simplified schematics. You will find advice on how to select your pen, ink and paper in the “tools” section. The First Step section focuses on 24 geometrical shapes. These are derived by breaking down the letters of the alphabet into simple elements. Click on the thumbnail to see the corresponding technical folder, which contains schematics and animation. This approach will help you learn the letters more efficiently and will also liberate your imagination once you get started with art creation. The alphabet section is also interactive, with an identical structure. Exercises are organized by level. Through these exercises, you will learn to combine letters in a word and link them to the typographic style. Art exercises are presented in the last section. From a simple shape such as a drop, these exercises will show you the mechanisms for transforming linear writing into an artistic figure. The objective is to help you develop the autonomy that will enable you to create your own artwork. This kind of writing was mainly used for commercial and administrative purposes. The Sumeric language was supplanted by the Accadic as the region’s language of exchange, and then later replaced by Aramaic around 2.000 BC. The Aramaic language is graphically characterized by 22 letters. This particularity distinguished it from the past systems, which were composed of hundreds of signs. From Aramaic, many different kinds of writing were generated, including the important Semitic group. Arabic writing is one component of this group (Early Aramaic, Nabatean, Arabic). Initially Arabic writing was very simple and without artistic elements, but the arrival of Islam with the transcription of the Holy Qur’an dramatically changed this writing. Orthographic reforms and new developments also appeared, along with a wide diffusion. Arabic calligraphy was developed not only through the Arabic language but also through other languages that adopted the Arabic alphabet, such as Turkish (before Ataturk’s reform) and Persian. This is a reminder of the fact that for centuries, peoples of other idioms from Andalusia to Indonesia were using this alphabet and consequently greatly influenced its artistic development. Starting from the simple transcription of a text, we arrived eventually at calligraphy, one of the pillars of the Arab Islamic arts. The Islamic prohibition on figurative representation in all religious monuments reinforced the artistic development of this expression. Calligraphy is used not only in the pictorial arts, but also in handicrafts (lamps, plates, etc.) and architecture. Calligraphic art often celebrates a divine message (verses of the Qur’an, hadith of the Prophet), but is also used for proverbs, poems or as a purely decorative element with the repetition of patterns. As mentioned above, the reproduction of the Qur’an had a major role in the development of calligraphy. In fact the expansion of Islam and the conversion of the non-Arab populations of the new Muslim areas opened calligraphy up to the artistic contribution of hundreds of new calligraphers with different artistic influences and training. Thus, over 15 centuries, many different historical and geographical contexts produced different styles and even some parallel evolutions, because of the plurality of cultural centers. After the systematic review of the Qur’an required by the Caliph Uthmaan, Abuu al-Aswad al-du’alii introduced a system of vocalization (tashkil) with colored dots. Each vowel was represented with a specific color. These calligraphers introduced the diacritic dots, which are the dots that are written above or below letters to distinguish between homographic letters that are otherwise easily mistaken for one another. · the circle, the diameter of which is defined by the size of the “alif. It represents the space within which each letter must be drawn. A student of Ibn Muqla, he continued to develop the aesthetic concepts of his master, underlining the importance of equilibrium, measure and space. Moving beyond the concept of harmony between letters, he created the concept of elegance. From his concepts arose the Persian school of calligraphy. Furthermore, he and his master established the six basic styles that every good calligrapher had to study: aaqlaam as-sitta: muh_aqqaq, riih_aan, thuluth, nashkh,tawqii’ variation of thuluth,riqaa’ simplified version of tawqii’. A musician, poet, and philosopher as well as calligrapher, it was his innovation to cut the top of the calam (a reed pen used in Arabic calligraphy) at an oblique angle in order to accentuate the differences while writing between the thick and thin parts of the letters. From him arose the Turkish school of calligraphy. Calligraphers used to have a very important position in society. The technical skills of calligraphy reached such a level that it was impossible to copy them without very extensive training. Calligraphers were pillars of the political power. Calligraphy also played an important role in the spread of religion and in the symbolization and personification of power. Since the development of modern communication technologies, calligraphers have lost this specific role in society. Nevertheless, the practice of calligraphy has not lost its strength, thanks to its artistic development. Modern calligraphers are always inventing news tools, new fonts, and new bases adapted to their vision of the art. As an example, Hassan Massoudy introduced the use of very wide and colorful letters where the objective is more to create a feeling or an emotion than to deliver a written message. Over the centuries, the development of calligraphy occurred within different historical periods (Omayyad, Abbasid, etc.) and in multiple regions. These circumstances gave birth to many different schools (Persian, Turkish, Maghrebian, Indian, Chinese, etc.) and of course to different fonts and styles. Kufi: The kufi style takes its name from the city where it was born: Kufa in Iraq. This style developed during the era of the second caliph Omar. Kufa was at that time the political and cultural capital of the Islamic world. Kufi style is characterized by the use of geometric shapes such as straight lines, angles and concave lines. This style does not have strict composition rules, so it is more flexible for ornaments. Kufi style was largely used for the incision of coins and for the decoration of monuments. Thuluth: The Thuluth style was created from the Tumar style by the Baghdad school. Thuluth means one-third. In fact, the tumar calam was reduced to one-third, from 24 horsehair wide to 8. The standard format of the paper (110×74 cm) was also called tumar. The thuluth is the most complete style for the gestures, and studying it gives the student versatility in approaching all the other styles. It may be used for all kinds of geometrical compositions: squared, round or specular. This style is frequently used to decorate religious buildings. Nashkh: This style was encoded in the X century by Ibn Muqla and his brother. It can be defined as the style of the “half.” For the vertical lines, the pen is oriented in such a way that only half of a full width is drawn. For horizontal lines, the full width is used. The main objectives of this style are readability and simplicity, not composition. Therefore it is widely used for all kinds of manuscripts and even as typography for books and newspapers. Nastalik (farsi): This style was created in the XIV century in Persia by Miir ‘aali bn hasan, who modified the cut of the calam. Nastalik is a contraction of two names–nashkh and talik–which correspond to two styles. Nastalik results from the fusion of these styles. It is used without vocalization and mainly to write the Persian language. During centuries, it was particularly used for writing the texts of miniatures and the transcriptions of poems. Today it is also used in countries such as Afghanistan, Nepal and Pakistan which use an Arabic-based alphabet. Diwani: This style was created in response to the desire of the Ottoman powers to have a script different from the one used by the religious community and the scientists. The Ottomans created a style for the diwan (chancellery) in order to edit imperial orders and for internal use by the sultan and his court. The diwani style was encoded by Ibraahiim Muniif in the XV century. At the end of this century, this style was so successful that it spread out to become one of the major calligraphic styles. Extremely versatile, it is characterized by a 30-degree inclination of its lines, and by the harmony between strict rules of construction and freedom of composition. It results in balanced words in a rich and highly artistic composition. Among the most famous compositions with Diwani, you can find the Tughraa, which is the official seal of the sultan. Riqa’a: The name of this style should not be confused with the name of riqaa,a variation of thuluth. A Turkish invention, the riqa’a style was used along with diwani for the chancellery’s official documents. Moreover this style was used for the comments and notes written on the side of the Qur’an, not to be confused with the main text itself. Its rules were established very late in the second part of the XIX century by the Turkish master Mumtaz Mustapha, counselor to the Ottoman sultan Abdelmajid khan. Though the first examples are dated from the end of the IX century, its use is relatively recent. It was born out of the need for a simple, easy to copy calligraphy. The Riqa’a is characterized by the same way of holding and cut of the calam as in diwani, and by an economy of moves, long lines, simplicity and small-sized letters. In fact the “alif,” which is usually eight points tall, is reduced to three points tall. Moreover because it is a very simplified style, it has limited possibilities of composition and no vocalization. Nowadays, this style is used a lot for the press. Maghribii: The Maghrebi (or Maghribii) is a style influenced by the kufi and the Andalusian styles. It is mainly used in the three countries of Maghreb, but also in other Arabic-speaking countries including Sudan and Mauritania. The three main types of this style are the Andaluusii, the Qayrawani (from the city of Qayrawan) and the Fasi (from Fes). The calam is one of the oldest writing tools. Antique Egyptians were already using it on papyrus. Made out of reed, rigid and flexible at the same time, its edge is cut in such a way that writing delivers charming and delicate plain and thin lines. Step 2: Cut the edge of the reed strongly with a sharp knife in order to get a beak shape. Step 5: File the edge with sandpaper for adjustment. This will help your pen slide comfortably on your paper. The ink: In the past, the different calligraphic schools had different recipes for the ink that were adapted to the characteristics of the support to be used, i.e., paper, leather, etc. The ink was mainly prepared with plants or animal fats, to which were added different kinds of dusts or sulfate for color and natural glues for consistency. For practical reasons, each calligrapher kept only a small quantity of ink in a little container. Before beginning to write, he would mix concentrated ink with water and a small quantity of sugar (for its fixing power). Thanks to these recipes the ink dries at surface and gets darker with time. The chemical inks (commonly called Chinese Ink) now used are dry quickly and maintain their stability well over time. Traditionally, the calligrapher used to put a wad of crude silk inside the little container. Nowadays, an alternative can be a small piece of nylon tights. This helps to control the quantity of ink on the nib of the reed pen and thus prevent big drops on the paper. The paper: Papyrus was the most favoured support and was preferred to parchment, which does not let the reed pen slip freely. As writing is performed from right to left, this latter characteristic is important. Shining paper from China started to arrive, but without success despite the fact that the reed pen could slide easily. In the IX century, similar kinds of paper were crafted in Baghdad and Samarkand. The use of this paper later spread throughout the Mediterranean area and then all over Europe. The paper can be easily coloured with natural pigments such as saffron or coffee. The pigments are boiled in water in which you soak the paper for few minutes and then leave to dry. Pen: Metallic pen are easier to use than traditional reed pens. Unfortunately, most calligraphic pens are designed for Latin calligraphy with perpendicular cut instead of oblique. Nevertheless, these pens can be used for Arabic calligraphy, with the inconvenience that the position of the hand will be less comfortable. In the tutorial, the pens that are used are the metallic Pilot Parallel pens (6 mm and 3,8 mm), which provide a nice distribution of the ink flow. A calligraphy pen holder with metal nibs will also provide excellent results. An alternative method for getting oblique cuts can be to use a left-handed Latin pen. Ink: Standard scholar Chinese ink is more than enough for beginners, as it dries quickly and does not interfere with slippage. Paper: Glossy paper is preferred, because the pen will slide easily more easily (for example, the back of calendar pages). The objective of this module is to make you familiar with how to hold the calligraphic pen and the use of ink. You will also learn to draw the main curves of this calligraphic style. All the curves in this module are obtained by separating letters into elementary shapes. By focusing on these elementary shapes, you will learn and understand the Arabic letters much more efficiently. This geometrical approach will enhance your imagination for your personal artistic creations. A legend describing all signs used in the chapter is located below the video. The Arabic alphabet comprises 28 letters and is written from right to left. The shape of a letter varies according to its position within the word–isolated, beginning, median or final. Unlike the Latin alphabet, Arabic has no capital letters. Some letters are never linked with the adjacent letter on the left side, even inside a word. For this reason, a word can be discontinuous. Some letters are homographic, that is, they share the same body but their diacritic dots vary from one to three and are located either above or below the body. Therefore, you can form 28 letters with only 19 bodies. Another characteristic of Arabic script is the absence of short vowels. Vowels are identified by small signs located either above or below the corresponding letter. As these signs are not compulsory, the Arabic language can become very difficult to read.